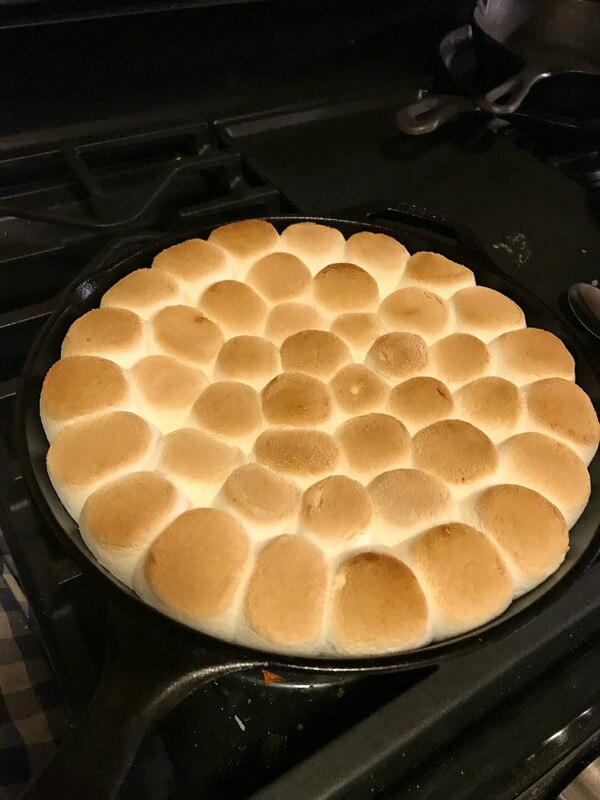 As we were planning for Super Bowl Sunday, hubby pulled up an e-mail he had received from Lodge Cast Iron with some recipes. He loves his cast iron cookware and was anxious to do some cooking in it for the big day. One of the recipes he picked to make was a super easy dessert that has just 4 ingredients. He actually used 3 because he forget to melt the butter in the skillet before he put in the chocolate. Anyway, it's super easy and super yummy. And it looks so impressive when cooked just right - with a beautiful layer of brown to the marshmallows. Place the 10.25 inch skillet in the oven for 5 minutes. Remove skillet form oven and melt butter in skillet, covering the cooking surface evenly. Oops..he forgot this step. I suspect it just makes cleaning easier. As of right now we still have half a pan covered and in the refrigerator, so I don't yet know what clean-up will be like. We might be having big regret about forgetting the butter when it's cleaning time. Pour chocolate morsels in the skillet covering the bottom and top with marshmallows. I didn't realize I got the mini chips. They melted nicely. Next time I am tempted to get some peanut butter or butterscotch chips to blend in for a different flavor. Bake 7 - 10 minutes until marshmallows are toasted. Remove from the oven and serve using graham crackers to dip. 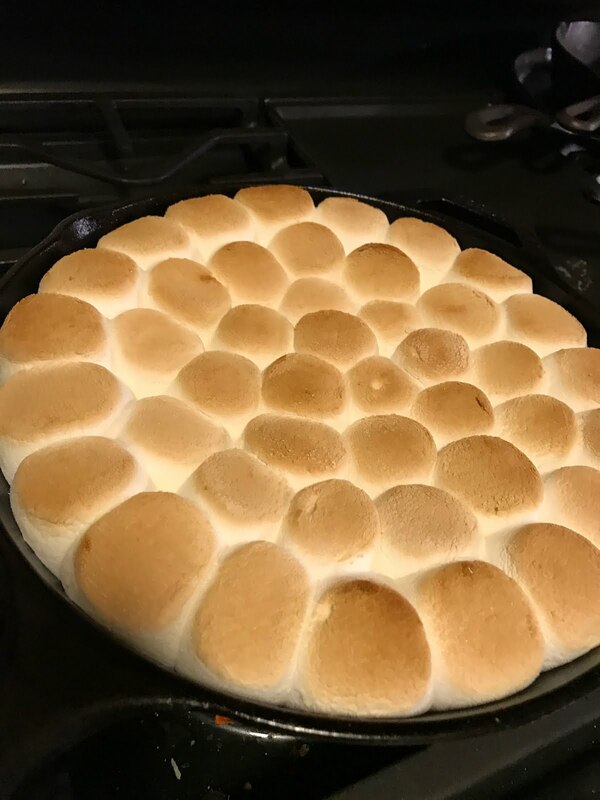 Hubby managed to pull them out with just the perfect hint of golden brown and the dipping was fun - pulling strings of gooey marshmallow and chocolate up high above the pan. We made another recipe from Lodge for Super Bowl Sunday and I'll share that soon. For more cast iron cooking recipes, visit their website at lodgemfg.com.